The Recovery Renewal Residential Program (RR) was designed for individuals who have substantial knowledge about treatment and recovery but have been unable to maintain sobriety. For addicts and alcoholics who have been through treatment before, few things are more disheartening than a relapse. Recovery literature reminds us, however, that there may be times when relapse lays the groundwork for complete freedom. At Cornerstone of Recovery, we understand how discouraged you probably feel to have stumbled and returned to old habits and ways of living, because for those of us who now work as part of Cornerstone’s staff, relapse is sometimes a part of our stories as well – but it’s most certainly not the final chapter. 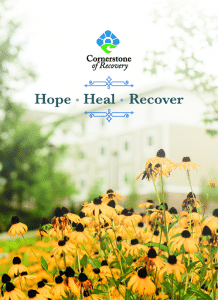 If you find yourself having surrendered weeks, months or even years of abstinence to alcohol and drugs, know this: The Recovery Renewal Program at Cornerstone is unlike any other treatment method you’ll find. The failure you feel? The complete defectiveness you see in the mirror? The utter hopelessness and misery that accompanies your every waking moment? You’ll check them all at the door when you come to Cornerstone, because the primary purpose of our Recovery Renewal program is to restore you to sanity and your life to something you don’t think is possible when you’re staring into the abyss of addiction. Relapse is not a requirement, but it is part of the recovery process for many addicts, and when it is, the hopelessness and sense of failure that go hand-in-hand with addiction are only compounded. As part of the Recovery Renewal treatment path, our goal is to help you understand that you haven’t failed; instead, you have to dig a little deeper, with our guidance, to understand what went wrong and how to avoid repeating those mistakes. We don’t regurgitate the 12 Steps you know from meetings and previous trips through treatment; instead, we’ll help you to arrive at a better understanding of those Steps, and to do some serious soul-searching and self-examination to uncover, understand and deal with the underlying causes of your relapse. What Is The Recovery Renewal Program Like? After medical observation and/or medically assisted detox to safely and slowly remove you from the drugs and alcohol, you’ll be immersed in a residential / inpatient program with a group of peers who are on a similar journey. Together, with the guidance of professionals from both academic and recovery backgrounds, you’ll unravel the threads of the life traps that have kept you from the new way of life that recovery promises, and you’ll learn new coping skills to replace those traps. During a stay that averages from 28 to 30 days, you’ll be immersed in a schedule that keeps your hands busy and your mind occupied; we’ll load you up with relapse prevention methods and tools; we’ll help you build back your self-esteem through group and individual therapy; and we’ll offer your family a part in the healing process as well, so that when your journey here is complete, you can return home a new person – a whole person – with the instruments you need, and the aftercare that Cornerstone provides, to stay clean and maintain a recovery that’s both fulfilling and bountiful. Your needs are different than those who are going through treatment for the first time; we recognize those needs as unique, and we work with you to develop an individual treatment plan that addresses them on physical, psychological, emotional and spiritual levels that may not have been explored in your previous experiences with drug rehab. We’ll help you address the trauma and resentments that act as mile markers in your life, those moments that your drug use has never been able to erase or anesthetize, no matter how long or how much you’ve tried. Know this: With Cornerstone’s Recovery Renewal program, you don’t have to run from that pain any longer. You can face it, in an environment that’s cathartic and supportive, and make peace with it. Because only then will you be able to truly know peace and find a way of life you never thought possible. It’s an intense program, but if you’ve tried to stay clean in the past and have been unsuccessful, even after previous residential treatment stays and 12 Step program attendance, it’s what you need. We know this, because at Cornerstone of Recovery, we’ve been treating addicts and alcoholics from all walks of life for almost three decades, and we know well the triggers and issues that stand in the way of successful long-term recovery. With the tools the Recovery Renewal program offers, as well as guidance in how to implement them in your daily life so that they become second nature, we will help you find that recovery. All that’s required is for you to pick up the phone and reach out. We’re waiting.